A gentle infusion of Organic Hibiscus flowers in Organic Virgin Coconut Oil and other natural hair conditioning oils.It has a lovely floral coconut aroma with bits of Organic Hibiscus Flowers in every bottle. 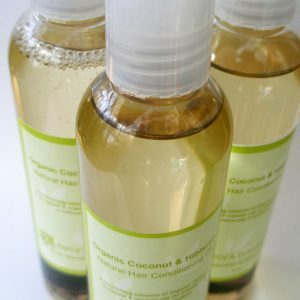 Our Organic Coconut & Hibiscus Hair Conditioning Oil is a very light, luscious blend of nourishing oils that will provide healthy conditioning, encourage hair growth, and add sheen & softness to your hair. It is also perfect for oil rinsing your natural curls to help soften & detangle hair. We have reduced the size of this one from 8 ozs. to 4 ozs. so that all of our hair & body oils are consistent in size:) Pricing will however, remain $10 but for the 4 oz. size. Our Organic Coconut & Hibiscus Hair Conditioning Oil is a very light, luscious blend of nourishing oils that will provide healthy conditioning, encourage hair growth, and add sheen & softness to your hair. Organic Virgin Coconut Oil, Fractionated Coconut Oil, Organic Jojoba Oil, and Japanese Camellia Japonica Oil infused with Organic Hibiscus Flowers. *Use it as a hair oil to naturally condition dry curls, locs & waves. *Use as a hot oil treatment for hair. *Use it to seal in much needed moisture on your skin in place of lotion.